Tonight, in Brisbane, I went to see Skroo Turner, CEO and founder of Flight Centre International. This was part of the Game Changer series put on by QUT and the Qld State Library. He was excellent and he participated in a conversation with the MC and then it was opened up to questions. I asked him, more in jest, in light of what has transpired over the last week over sexism with our prime minister if there was room for a female captain (no body laughed) and as a CEO and with a name like SKROO does he ever get angry with his workers or wife for that matter and if so how does he deal with it. He appreciated the question and seemed to answer it graciously. Someone then asked what was his biggest mistake and he hinted at the last 6 years and his foray into the online space which has been a disaster for FC.and no surprise to me as he seems to have a myopic approach to his offline business that has brought his shares for around $18 some 7 years ago to some $40 now. 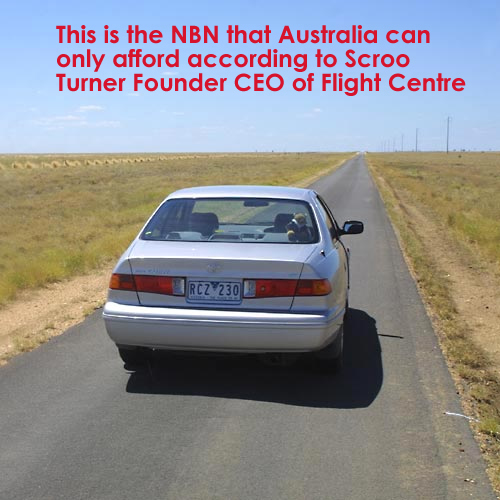 Funny, during his conversation he mentioned the NBN and said that Australia cannot afford it. That it is like a Rolls Royce versus a Holden and we can only afford a Holden. This comes from them man that admits they have no online strategy other than having a website and freely admits that “he lost control” of his online foray (because he had not got a clue about it), and once again no surprise to me. All through the talk it was mentioned his turnover (they carry 1.5 Billion cash at any one time) as opposed to profits. But it does not take a big stretch of the imagination to work out how much profit FC makes in comparison to an online travel agent like say Wotif or Expedia for example. My guess it is 10 to 1 more profits for the online stores. All up a great night and fun had by all with drinks and networking after but somehow I doubt that there will ever be another bricks and mortar giant like this that will ever startup ever again. This one was more for the museum,in my humble view.